For the next six years, Derek was the Director of Jazz Studies at Abilene Christian University, in Abilene, Texas. In between teaching classes and lessons, directing the various jazz ensembles, starting up the annual Abilene Jazz Fest, and lots of grading, Derek formed and led a popular jazz/rock fusion group The Abilene Jazz Collective. On the side, Derek further challenged himself to see how full a sound he could get out of one horn, with no electronic help. Using some established techniques like slap-tonguing and double-tonguing, as well as some not-so-established techniques like Tartini tones and various new percussive sounds, Derek found something truly fresh! 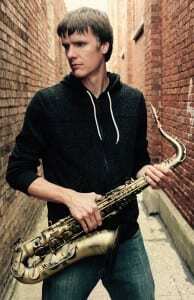 Now living in Chicago with his wife Rachel, Derek has hit the ground running as a full-time freelance saxophonist, a dream he’s had since he picked up the horn in middle school. His Youtube following has grown fast, as he releases new BEATBoX SAX music videos and tutorials regularly. This online success has led to his endorsements with Legere Reeds, JodyJazz Mouthpieces, and P.Mauriat Saxophones, as well as performance and clinic opportunities around the world, including France, Germany, Malaysia, and Brazil. You can see and learn about this new way of playing the saxophone on his popular “BEATBoX SAX” YouTube channel, where Derek releases a new tutorial every week.